I know that most of you know that Fortnite isn’t on Google Play, but for those who don’t and go search for it there, Google will indeed let you know. That’s nice of Google, since there are bound to be apps that want to trick you into believing they might be Fortnite for Android on Google Play. 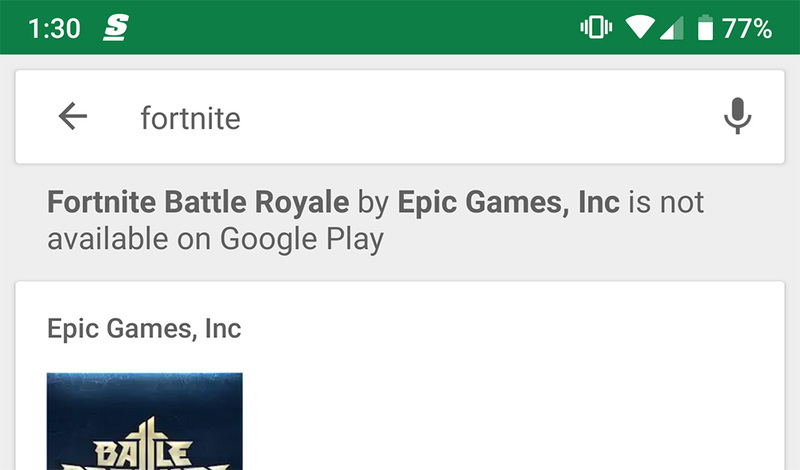 When searching for Fortnite, Google is currently displaying a message at the top of Google Play that says, “Fortnite Battle Royale by Epic Games, Inc is not available on Google Play.” When you quickly scroll past that and find FortBrite Battle Boil, install it, and get scammed out of hundreds of dollars, don’t say Google didn’t warn you. Fortnite isn’t on Google Play because Epic Games decided to keep it off and rake in all the cash, which you already know. Instead, Epic is distributing Fortnite directly to you from their own site. You can download it right here. Just know that if you try and get the game from there, you may be given confirmation of a beta sign-up without actually being able to play it immediately. Epic says that that’s because they are slowly rolling the game out in waves to people. We actually think it’s because there is a Samsung exclusive deal put in place, but no one seems to want to confirm that. And I say that since Samsung Galaxy phones, like the Galaxy S8, Note 8, Galaxy S9, and Galaxy Note 9, have no issue getting the game up and running when downloading from the Galaxy Apps store. When the slow rollout of invites is finished and you get invited, you will need a supported device for Fortnite. You can view the full list here, but phones like the Pixel 2 and Pixel 2 XL, Essential phone, LG G5/G6/G7, LG V20/V30, OnePlus 5/5T/6, and Razer Phone are all supported. PRO TIP: To try and jump the line, don’t install Fortnite .apk files from anywhere else outside of Epic’s site and the Galaxy Apps store. It’s not going to be worth it. Just be patient and get it legitimately. Everyone playing? How’s the Fortnite Android experience?